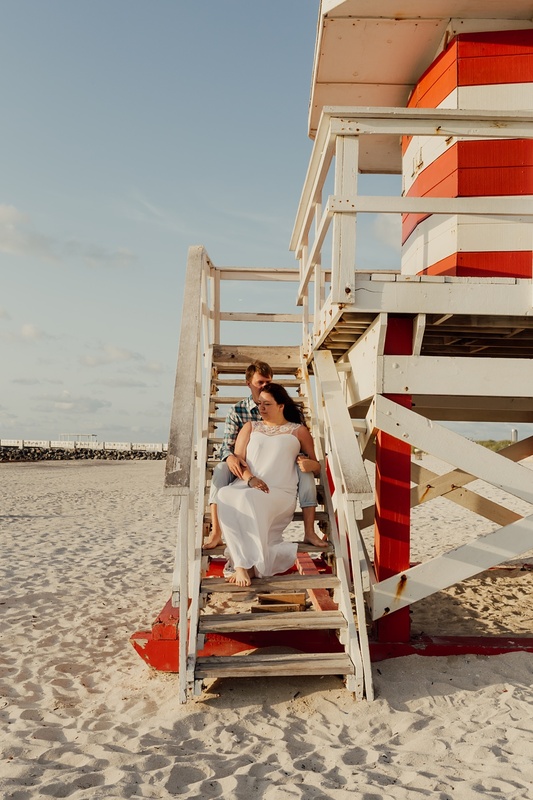 I’m still on a major high from shooting Alina and Lev at their destination photo session in tropical, sunny Miami Beach, FL. Talk about a gorgeous place – and gorgeous people – to photograph! For the shoot, we spent most of our time at South Pointe Park, which offered the perfect backdrop for their pictures. Don’t you just love her dress? And how about their expressions when they look at each one another? I could seriously feel the love radiating off these two, who met 5 years ago in Russia. So why were we in Miami, FL, you ask? Well, Alina said “We decided to have our wedding in Russia in the winter - after all, all weddings are in summer, and we wanted to show off. The wedding was in February, there was a lot of snow and the place where we celebrated looked like a fairy tale. We decided to spend the honeymoon in America, where we were lucky to get visas. We planned a very big trip: New York, Orlando parks, Miami beaches, Los Angeles, casinos and shows of Las Vegas - all this we had to see and experience. 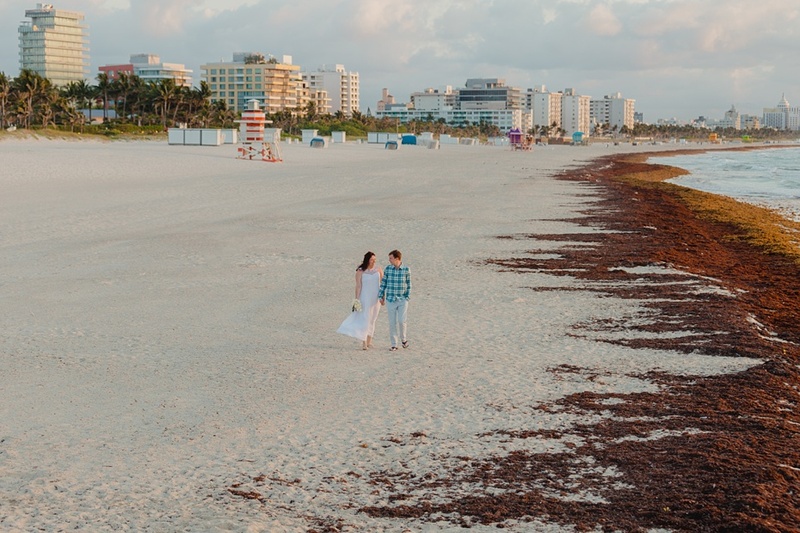 Someone said that we had a tour like rock star :) The idea of a photo shooting in Miami appeared, because we already had winter wedding photos, but we really wanted summer ones as well and Miami Beach looked perfect for that. Actually Lev is not a fan of taking pictures, but for me he was ready for a photo shoot. Jennifer Cortiella was advised to us by our acquaintances as a professional photographer who can take care of us. We looked through her portfolio and liked the photos posted on her website so we contacted her. 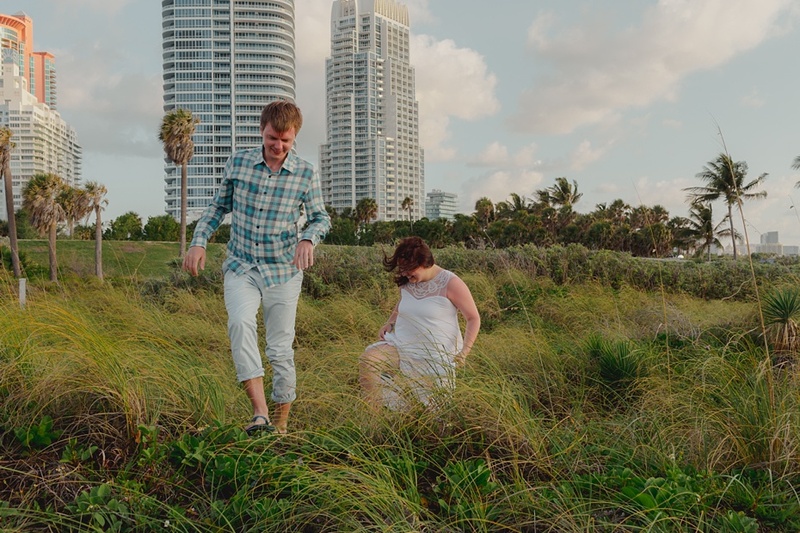 We were lucky and Jennifer had free hours for our photo session - on the beach of South Park in Miami Beach at dawn. I had not hoped that we could find a good photographer a couple of days before the day of photo-shoot, so I was very pleased with the opportunity. In the morning of that day, we gave Lev a big mug of hot coffee and went to the beach, where we had a wonderful few hours in the company of Jennifer, walking and fooling around while she was taking pictures. Within a week our photos were ready - high-quality, beautiful. Our dream has come true, now we have winter wedding photos, and summer – seriously, do you know anyone has done that before? :) Well, even if somebody did, we are still the happiest in the world, because we are together and we love each other very much. And these wonderful photos will stay with us forever as memories of the beautiful honeymoon spent in America”.